If you struggle with weight loss resistance, hair loss, or Candida overgrowth you may have assumed it was due to Hashimoto’s hypothyroidism. Although it is true that these issues are common in cases of autoimmunity and/or low thyroid, the thyroid gland is the sentinel organ of the body and these symptoms (and more) can also be related to heavy metals adding to your body’s overall symptom burden. 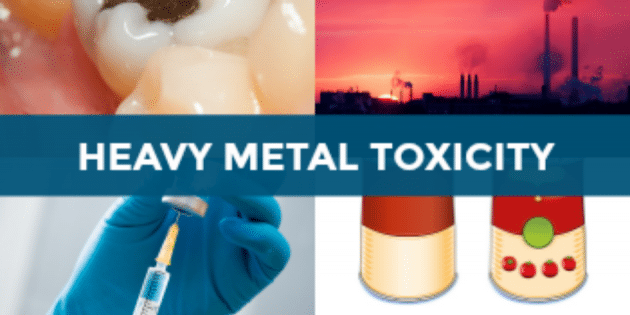 So, what exactly is heavy metal toxicity and what should you do? In the simplest terms, heavy metal toxicity refers to the accumulation of high levels of a heavy metal in the body’s soft tissues. The most common heavy metals found in human tissue at toxic levels are mercury, lead, cadmium, and arsenic. Heavy metals can be found virtually anywhere as they are in the air, soil, water, food (especially fish & seafood), dental fillings, rice, well water, vaccinations, coal, high-fructose corn syrup (HFCS), fire retardant fabrics, fluorescent light bulbs, breast implants, aluminum cans, some medications (tin has been found being used as a filler in some medications), on the job exposure, exposure to lead-based paint and medical treatments; and, over time they place an extreme toxic burden on the body. Exposure to heavy metals happens every day because they are in the environment. Heavy metals enter the body by ingestion, inhalation, or absorption through the skin or mucous membranes. Heavy metals feature a chemical structure that causes them to damage normal and complex functions of the body at the cellular level. It is true, however, that heavy metals do occur naturally in the earth and are typically present in low levels without presenting any sort of health crisis. But when heavy metals are utilized commercially and end up in concentrated amounts in the products you purchase, bring into your home, and incorporate into your daily life, it’s a very different story. Besides plutonium (which is radioactive), mercury is the most toxic threat to Mother Earth for humans given its profusion in the environment. 1/1000th of a gram is considered toxic and thousands of tons of mercury are released into the environment every year. It is a known neurotoxin and contributes to a broad range of conditions including autism, memory loss, Alzheimer’s disease and inability to conceive. As of this writing estimates from clinical evaluations showed that 1 in 13 women of childbearing age has dangerously high mercury levels which could pose a risk to the fetus. Mercury is also commonly found in umbilical cord blood post delivery. Mercury is transferred from mother to fetus during pregnancy which may help explain why 1 in 6 children today has a neurodevelopmental problem. Mercury is extremely toxic and is very difficult to eliminate from the body. Just one exposure to mercury can take 15 to 30 years to eliminate half the mercury from the body. Mercury exposure can occur through a variety of sources with the most common being dental fillings, coal, high-fructose corn syrup, fish, and fluorescent light bulbs. The type of dental fillings that contain “silver” fillings contain approximately 50% mercury which gradually seeps out of the fillings and into the body. This is one reason I do not recommend oil pulling for anyone who has mercury fillings. European countries including Sweden, Norway, Denmark, and Germany have restricted or banned the use of mercury in dental fillings, especially in children and in women of childbearing age. In 2013, the United Nations signed a global treaty to phase out mercury in dental fillings. The European Commission also recommended phasing out completely. Coal is mined and burned to generate electricity. Unfortunately, it contains mercury. Power plants that burn coal release thousands of pounds of mercury into the atmosphere every year. China and many of the world’s quickly developing countries are building coal-burning plants at rapid rates. This means the amount of mercury released into the air is increasing every day. If you work in the clinical setting as a nurse or doctor you may have noticed high-fructose corn syrup as one of the ingredients in intravenous (IV) solutions or IV medications. I found this to be a huge shock. Why on Earth would we give our sickest patients HFCS? Even though it is a common sugar substitute that’s very cheap, one of the first steps in the production of HFCS is to soak corn in a solution that contains mercury. This same mercury can end up in food and food additives. The European Commission emphasized that long-term exposure is a problem since heavy metals like mercury accumulate in the body. A study by the Institute for Agriculture and Trade Policy in the United States revealed that when HFCS was the first or second ingredient listed on a product label, half the processed food samples tested contained mercury. Just as mercury ends up in the human body, it also ends up in fish. The bioaccumulation of contaminants in fish (particularly mercury), is a growing concern and the problem has increased dramatically over the past decade. Governments are finally releasing warnings about the dangers of eating too much fish and shellfish, especially for children and women who are pregnant. It is always best to opt for open-water wild-caught fish as opposed to farmed fish (which has higher levels of pollutants and are usually treated with antibiotics). This is the only wild-caught fish resource I trust. The Food and Drug Administration (FDA) issued a public warning stating that if a woman who is pregnant consumes a single 85-gram portion of shark, swordfish, marlin, king mackerel, tilefish, or tuna, that she will ingest enough mercury to damage the brain of her fetus. Fluorescent light bulbs contain mercury and if the bulb ever breaks, it should be treated with extreme caution. Fluorescent bulbs may help to cut down on the use of energy, but it’s not without risk to your health. You can read the suggestions for proper clean up of broken fluorescent light bulbs or a mercury thermometer here. Lead poisoning causes many health problems including brain and nerve damage. Blood testing reveals elevated levels in the blood for recent exposure to lead; however, lead is absorbed by the brain and other tissues, and blood tests aren’t good at registering high levels of lead in the brain. The major sources of lead can be found in lead paint, water supplies, older homes that have lead plumbing or lead soldering, and industrial plants. In the US, lead was found in house paint before 1978 and in toys and furniture before 1976. Lead can leach into drinking water and the problem is more common than you may realize. As many as 16% of household water supplies in the US have dangerous concentrations of lead. flush your pipes before drinking, and only use cold water for cooking and drinking. The more time water has been sitting in your home’s pipes, the more lead it may contain. Use only water from cold tap water for drinking, cooking, and especially for making baby formula. Hot tap water is more likely to contain higher levels of lead. The World Health Organization reported that more than 80% of the daily intake of lead is derived from the ingestion of food, dirt, and dust. The amount of lead in plants depends on the soil concentrations and is highest around mines or smelters. Cereals contain high levels of lead. Milk or formula is a significant source of exposure to lead for infants. Beware of ordering wild poultry in restaurants. Game and fowl caught by hunters may contain lead from the bullets used by hunters. You might ask the restaurant staff, or be safe and don’t order it at all. Aluminum exerts toxic effects on the brain and is linked to neurologic conditions that mimic Alzheimer’s disease. Aluminum toxicity has also been linked to rickets, intestinal problems, extreme nervousness and anxiety, anemia, headaches, memory loss, speech impairment, aching muscles, and colic. Arsenic is an element that is naturally-occurring in the soil, and the concentrations of arsenic in the environment vary from location to location. Increased exposure to arsenic can have devastating effects on your health. For example, toxicity from arsenic can cause intestinal problems, anemia, skin lesions, liver damage, kidney damage, and death. The US Environmental Protection Agency stated that arsenic can cause several types of cancer in humans. A study published in the Journal of the American Medical Association found a link between increased arsenic levels and type 2 diabetes mellitus in adults. In recent years, the use of arsenic in chicken farming has become a valid concern. Roxarsone, which is an arsenic-based substance is added to chicken feed by mass production farming operations is intended to help cut down on parasites that live in the intestines of the chicken. The problem with this practice is the potential health issues that can arise in humans from consuming chicken and that it’s toxic to the environment overall. Antimony is a heavy metal used as a fire retardant in many fabrics. It’s also a potent toxin that can enter your bloodstream and your body’s tissues within 2 hours of exposure. Antimony accumulates in the organs and in bone tissue and it can disrupt the way your organs function, causing anorexia, fatigue, muscle pain, hypotension (low blood pressure), fragile red blood cells, mental changes, and chest pain. Tin is a common heavy metal and is often combined with other materials to form compounds some of which are easily absorbed by the body when tin is ingested (in food or water), and, fortunately, some of the other tin compounds are less likely to enter your system because they’re not as easily absorbed by animals and humans. Toxicity from tin exposure can occur from oral ingestion. Nausea, vomiting, and diarrhea have been reported after ingesting canned food containing 200 mg/kg of tin or more. Tin may be inadvertently ingested a number of different ways. For example, you can ingest tin if you eat or drink something that comes from a tin can that has a damaged liner. Tin is also present in solder, kinds of toothpaste that contain stannous fluoride, and in health and beauty products like soap and perfume. Tin has also been found as an inactive ingredient (filler) in some prescription medications. You can also find tin compounds in rodent poison, fungicides, wood preservatives, herbicides, and sprays to control mites and ticks. Limit dust in the home and remove your shoes when entering your home. Remember that heavy metals collect in dust and dirt. Be aware of local fish advisories regarding mercury levels. This is the one and the only resource I use and recommend for delicious wild-caught fish. Be aware of sources of lead exposure. Read labels on products coming into your home to see if they put you and your family at risk for heavy metal toxicity. Chelation therapy is a medical treatment used either to treat metal poisoning or to remove toxic levels of heavy metals from the body when it cannot excrete them. Chelation as a medical intervention uses oral and intravenous (IV) chelating drugs which are prescribed to lower the levels of heavy metals like mercury, cadmium, arsenic, lead, and uranium by attaching to them, which helps to remove them through urination. The word “chelation,” in Greek, means “to claw” and in this case, representing how a compound claws or grabs a toxic metal in addition to all sorts of chemical toxins. Since there is controversy and not sufficient evidence on their safety, I don’t recommend the use of chelation drugs. There are natural chelators that your body produces (such as glutathione) or that you can source from your diet (such as dietary fiber, sulfur-containing foods like eggs, onions, and garlic, and antioxidants and phytochemicals from plant foods, such as cruciferous vegetables). Natural chelators bind to toxins and neutralize them before than can do any (or more) damage, and facilitate their safe elimination. Avoid alcohol and any over the counter medications (OTCs) unless prescribed by your doctor especially Tylenol (Acetaminophen). Increase flavonoid-rich foods like apples, celery, onion and garlic which may assist with inflammation and immune support. Detoxification is defined as any chemical and/or mechanical process that removes a substance that is injurious to your body or that changes a toxic substance so it’s no longer harmful. There are a number of different detoxification methods however not all methods are safe for people with hypothyroidism or Hashimoto’s. The body has an extraordinarily complex array of internal detoxification systems that change, break down, attack, destroy, or eliminate threats to our internal environment and our health.These internal systems for detoxification are the stomach, intestines, liver, immune system, kidneys, and lungs. Each organ system works in a different way to keep the body as toxic-free as possible. External detoxification involves your skin, and it’s second to none. Your skin serves as an important barrier that keeps many toxins from entering your body. Your sweat glands which are housed in your skin also play an extremely important role in detoxification. I always recommend before considering any type of detoxification program that you assess your detoxification capacity. What you don’t want to happen is the incomplete elimination of toxins. This is an unintended consequence of starting a detox program without preparing the body correctly. For example, the liver utilizes key nutrients for phase I and phase II detoxification in order to neutralize and eliminate toxins. If you are deficient in these key nutrients whether it be to a less than optimal diet or absorption issues, you may experience incomplete detoxification and reabsorption of toxins. What is the number one sign? Weight gain! If you’re doing everything “right,” e.g. 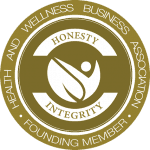 everything your practitioner and wellness team have recommended and you’ve not made the progress you’d hoped for, you may want to rule out heavy metals especially if you’ve been exposed to them in the past or present. This convenient at-home 24-Hour Heavy Metals with Cadmium Urine Test also tests Mercury, Arsenic, and Lead and is intended to evaluate and monitor exposure to heavy metals and evaluate the process of detoxification. Excessive Cadmium can damage lungs, kidneys, and the digestive tract. 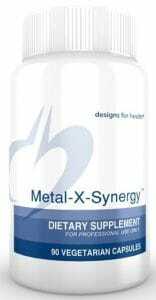 Metal-X-Synergy™ is designed to help support the normal process of heavy metal detox from the body. It contains a wide array of ingredi­ents, which work together to reduce the initial absorption of metals into the tissues and organs, pull them out more effectively, and help to decrease their reabsorption through enterohepatic recirculation. Metal-X-Synergy™ contains patented complexes of modified citrus pectin and algimate, two complex polysac­charides that work together to bind to heavy metals without deplet­ing essential minerals from the body. Consider combining this for­mula with Hepatatone Plus™, Amino D-Tox™ and/or VegeCleanse™ for liver and detoxification support. Made with non-GMO ingredients. 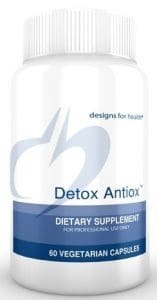 Detox Antiox™ synergistically combines an extensive array of nutrients that combat free radicals and help support the detoxification of chemicals and heavy metals. * Made with non-GMO ingredients. 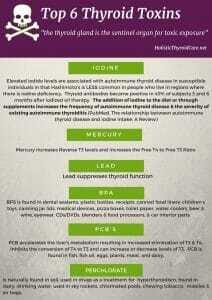 If you have heavy metal toxicity my hope for you is that you get the help you need. It’s virtually impossible to improve your health or get into remission from Hashimoto’s or any autoimmune disease without eliminating toxins. They don’t disappear over time – a targeted approach to eliminate them is essential.